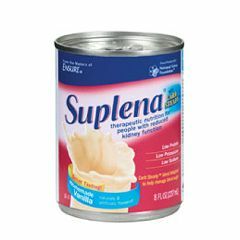 Specifically formulated for patients with reduced kidney function Suplena is a low-protein, nutritionally complete formula with a vitamin-mineral profile specifically designed for people with chronic or acute renal failure who are not receiving dialysis. The protein content of Suplena is adequate to prevent catabolism of tissue proteins, yet minimizes exacerbation of uremic symptoms. The high-quality protein of Suplena meets or surpasses the standard amino acid profile for protein of high biologic value. Suplena is gluten-free. Acts Quickly. Good Taste. Simple To Take. Produces Results. I would like to know that if taking this will it increase my weight gain. I am 33 yrs old and still sitting at 41kg!!! I need the ingredients in suplena to take to my dads doctor because his potassium has become very high and by us not knowing the ingredients they have told him to stop taking it.